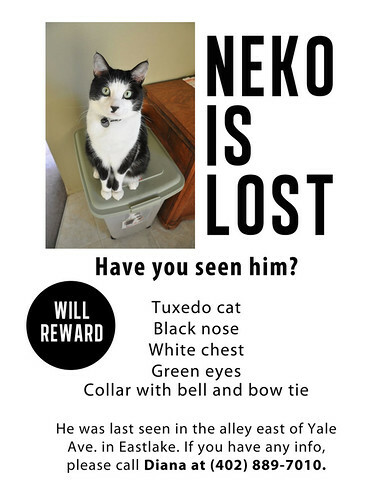 Lost cat: Have you seen Neko? Eastlake resident Diana Riggs is missing her cat, Neko, and she’d like to get him back. He’s been missing since Tuesday. Neko was last seen in the alley east of Yale Avenue in Eastlake. If you find him, contact Diana at 402-889-7010. There is a reward. “I can’t even tell you how much I miss him,” Diana says. And feel free to text the phone number or email dianamyong@gmail.com if you are not in to talking Thank you! Yes!!! He as at my place on Franklin & E Lynn last night. He is skinny but ok. I fed him tuna. He has no collar on, but I’m sure it’s him. I have Diana’s phone number.